Good friends in Los Angeles pleasantly surprised me recently with a couple of gifts, including a souvenir spoon from the 1984 Los Angeles Olympics. The mascot, Sam the Eagle, adorned in a loud red-white and blue had, proudly holds the Olympic torch aloft at the tip of the spoon’s handle. After marveling at the thoughtfulness of my friends, and this artifact from my university years, my mind lept to that simple question. Spoon collecting, as I now know, has a long tradition. In the mid-1800’s in Europe, merchants would sell spoons, and likely other utensils, with images of famous people or local landmarks on the handles or in the bowls of the spoon. Wealthy Americans who travelled in Europe would make it a habit to collect souvenir spoons wherever they went. In the late 19th century, souvenir spoons became a big business in the United States, triggered by two particularly popular souvenir spoon lines, One was the George and Martha Washington series, manufactured by a company called Galt & Bros initially in honor of the 100th anniversary of America’s first president. 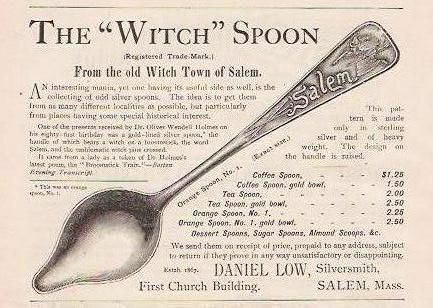 The second hit series was the Salem Witch Spoon series, featuring, well, a witch. An American jeweler went to Germany and saw a wide variety of ornate and unusually designed spoons, and decided that America was ready for a souvenir spoon recalling the 17th century witch hunts of Salem, Massachusetts. According to this PBS article, by the mid 1890’s, there was an unprecedented boom in spoon collecting. With the advancement of mass manufacturing of the industrial age, and a collapse in the silver market, spoon collection was affordable to the growing middle class while still maintaining that hint of posh. At the end of the year 1890, there were only about five souvenir spoons patented or in production in America; by May 1891, there were hundreds on the market. More patent designs were issued for souvenir spoons during this decade than for the entire period from 1790 to 1873 or after 1900. The 1890s witnessed cutting-edge innovation in the making of souvenir spoons: this decade saw the production of cast spoons (i.e. souvenir spoons made according to the lost wax process); the perfection of engraving and bright cut decoration; the introduction of embossed designs in spoon bowls and on handles; and, the production of exquisite enameled spoons which today are considered miniature works of art. Apparently, spoon collecting is still obsession for many people today. For a detailed display of one person’s own spoon collection, watch this unusually framed video. Posted in Others and tagged 1984 Los Angeles Olympics, Antiques and Art, Galt & Bros, Salm Witch Spoon Series, Sam the Eagle, souvenir spoons, spoon collecting, Washington Spoon Series. Bookmark the permalink. The Groundbreaking Wilma Rudolph Part 1: Just Get Me the Stick!